The world-famous Budweiser Clydesdales are ready for Tampa's Gasparilla Pirate Festival! 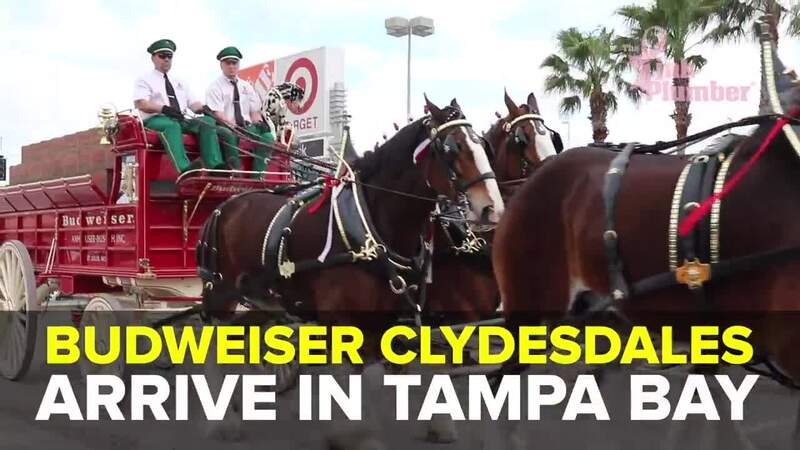 The world-famous Budweiser Clydesdales are in Tampa this week ahead of the Gasparilla festivities and will even deliver beer to a lucky consumer's home on Gasparilla eve. The eight-horse hitch will be harnessed and hitched to the red beer wagon and will be part of the traditional Gasparilla Parade of Pirates in Tampa Saturday from 2 p.m. to 5 p.m. There you'll be able to see the Clydesdales wagon ride down Bayshore Blvd. amidst pirate costumes and music. On Friday at 3 p.m., the day before Gasparilla, the horses will crash a house party and deliver cases of Budweiser. That will take place at 3201 Polo Place Dr. in Plant City. The Clydesdales also appeared at the Walmart in Land O' Lakes Wednesday afternoon. Thursday they will be at Total Wine Tampa at 1720 N. Dale Mabry Blvd. 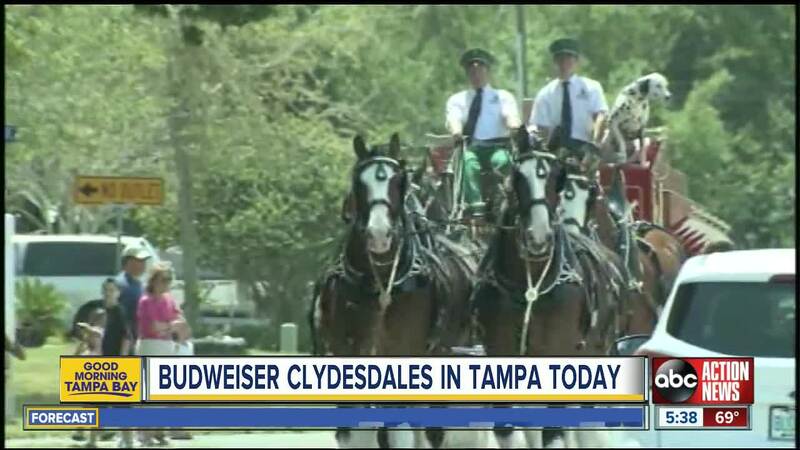 from 3 p.m. to 5 p.m.
“The Clydesdales’ appearance in Tampa is one of hundreds made annually by the traveling hitches. We are honored to have the Clydesdales in Tampa to celebrate the capture of the City of Tampa, once again. We started a new tradition of surprising a lucky consumer in the past couple of years with a Gasparilla Eve home delivery by these giants, and it has become a huge hit for the Tampa community”, said Bill Gieseking, Director of Marketing at Pepin Distributing Company. Canadians of Scottish descent brought the first Clydesdales to America in the mid-1800’s. Today, the giant draft horses are used primarily for breeding and show. Horses chosen for the Budweiser Clydesdale hitch must be at least three years of age, stand approximately 18 hands – or six feet – at the shoulder, weigh an average of 2,000 pounds, must be bay in color, have four white legs, and a blaze of white on the face and black mane and tail. A gentle temperament is very important as hitch horses meet millions of people each year. A single Clydesdale hitch horse will consume as much as 20-25 quarts of feed, 40-50 pounds of hay and 30 gallons of water per day. Each hitch travels with a Dalmatian. In the early days of brewing, Dalmatians were bred and trained to protect the horses and guard the wagon when the driver went inside to make deliveries.